The public areas are well furnished and clean maybe because hardly anyone uses them. There was absolutely no evening entertainment in two weeks even though it was advertised as having some on three nights per week. The courtesy bus provided stops running at 6 o clock and so taxis are required unless you wish to be in bed as soon as dinner is finished. About 5 euros each way to town or a forty to fifty minute walk. Food was of a very poor standard, except on one night, possibly a stand in chef, and not very hot. breakfast consistently bad. Ask waiters to bring you freshly cooked items or stick to toast and croissants. Pool area is very clean and tidy. Rooms are basic but kept clean with fresh towels and linen. no complaints here. Satellite TV is provided but only in Spanish and German. Internet costs 1 euro for 30 mins and is reasonable, unfortunately it broke down on our 4th day and despite promises had not been fixed when we left. Hot water in the room was inconsistent and the lifts may cause whiplash injuries when they stop. Use this hotel room only if you can or better still go somewhere else. 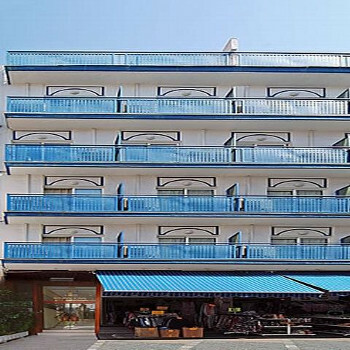 The standard of rooms is excellent either with balcony with view toward the sea or rear view towards the mountains. Rooms are large and clean as are the bathrooms with plenty of hot water under a good pressure. Furnishings are basic but up to the standard expected of the star rating.